Spider veins are a cluster of red or blue coloured veins close to the surface of the skin. They are commonly seen on the legs or face in a spiders web or branches of a tree formation. Is spider vein removal possible? Yes. 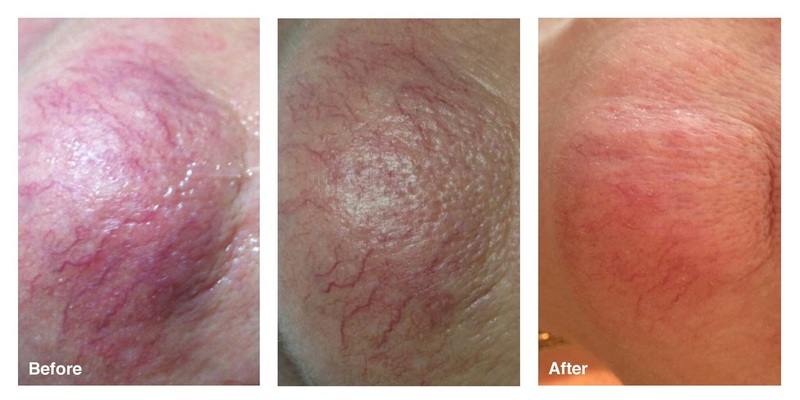 Spider vein removal is easily performed with laser therapy. Large varicose veins can be relieved of the congealed blood clogging the veins with IPL or E Light Photo Therapy. Once varicose veins become painful it is best to seek medical attention to ensure they are not causing any acute complications. How does IPL or E Light laser therapy work to remove spider veins? We adjust the settings on our IPL or E light laser hand pieces to target the coagulated blood in the broken capillary or spider vein. This will blast the haemoglobin blockage and send it into the blood stream for removal by the lymphatic system. How many laser treatments are needed for spider vein removal? The amount of laser sessions required will depend on the size of the area to be treated and the depth of the haemoglobin congestion. Most need at least 6 treatments to achieve a satisfactory outcome. Can I add spider vein or cherry angioma removal to my facial treatments? Yes, many of our clients will add the 15 min service on to their treatment to gradually work on removing spider veins, cherry angioma, spider angioma, broken capillaries, rosacea and cuperose.